Official pamphlet from "Nitro+CHiRAL Fes." 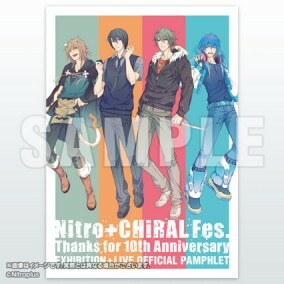 The official pamphlet for the grand event "Nitro+CHiRAL Fes. Thanks for 10th Anniversary," held over Sept. 21-22, 2015 at the Omiya Sonic City arena in Saitama Prefecture. Features commentary on various works by scenario writer Kabura Fuchii, a stroll through the 10 year history of Nitro+CHiRAL, and messages from various production staff members all collected into one neat package.